As a result of their stubborn views, the brothers chose to ignore many opposing opinions or facts that contradicted their beliefs. 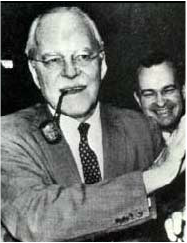 "Nor do I think that Foster Dulles gave the plan anything like the detailed, even loving, scrutiny that his British opposite number undertook." 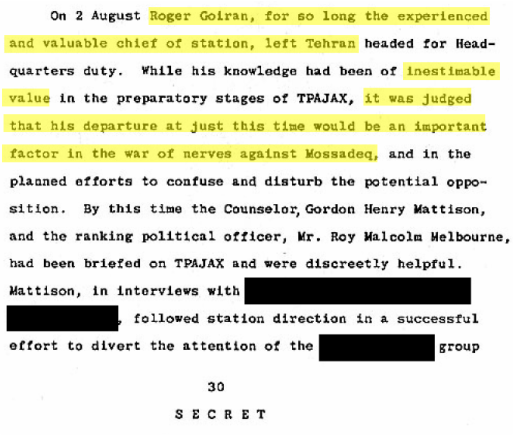 "The CIA station chief in the years before the coup, Roger Goiran, was replaced...this occurred because Goiran opposed the coup." Excerpt from the Wilber Report relating to Roger Goiran's dismissal. Click here for the relevant section from the document. "[John Foster Dulles handled] discrepant information [by] discrediting the source of the new information; reinterpreting the new information so as to be consistent with his belief system; or searching for other information consistent with preexisting attitudes." Despite evidence to the contrary, the Dulles brothers were extremely wary of the communist Tudeh Party in Iran, which led to their presumptuous and stubborn decision to instigate the coup. The British used this fact as leverage to recruit the United States in their coup effort. "We have enemies who are plotting our destruction. And any American who is unaware of this is like a soldier asleep at his post." "[Foster] Dulles could not distinguish between indigenous nationalism and imported communism." "Stalin’s aims in relation to [Iran] were limited and secondary to more important goals in Europe." to gain United States assistance in the coup. 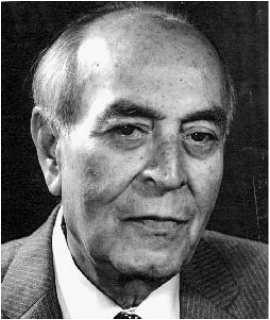 "When the British told him that Mossadegh was leading Iran toward Communism—a wild distortion, since Mossadegh despised Marxist ideas—Dulles and Eisenhower agreed to send the CIA into action." Collaboration in the CIA both internally and inter-departmentally with other organizations in the Eisenhower administration was flawed and fraught with misunderstanding. Excerpts from The Report on the Covert Activities of the Central Intelligence Agency, also known as the Doolittle Report. Click here to view the full report. Excerpt from the Bruce-Lovett Report to the CIA, 1956. Click here to view the full report. Due to the Dulles brothers' absolute and stubbornly arrogant views, their subordinates were hesitant to voice their concerns. The concerns of those that did vocalize were often overlooked. "I was morally certain that almost half of those present [at the secret Operation AJAX planning meeting], if they had felt free or had the courage to speak, would have opposed the undertaking."